This article helps answer all your questions on shower enclosures, one of the more popular home products that homeowners choose to buy for their house. Pioneer Glass is very experienced in helping homeowners choose the best option for shower enclosures and will install it for you! When considering quotes for frameless, semi framed, and framed shower enclosures and doors, make sure that you are comparing apples to apples. The main difference in price may be the thickness of the glass and whether there will be a surface protectant added. FRAMELESS SHOWER ENCLOSURES are all the rage and 90% of our requests are for frameless shower enclosures. I certainly agree as they can be truly spectacular! Frameless shower enclosures can mean slightly different things to different people. A true-to-name frameless shower enclosure should have no frame whatsoever and just hinges and metal clips to hold the fixed panels in place. To do this, everything must be completely square. While we all like things perfect, sadly, life is not that way. It may make sense to use small amounts of U-channel which can help adapt to small imperfections in the level of your shower area. U channel can generally be matched to your shower hardware and is relatively unobtrusive. In addition, for longer spans, a header may need to be installed. A metal rail fitting over shower glass panels that secures them to the floor, ceiling, wall or another glass panel. 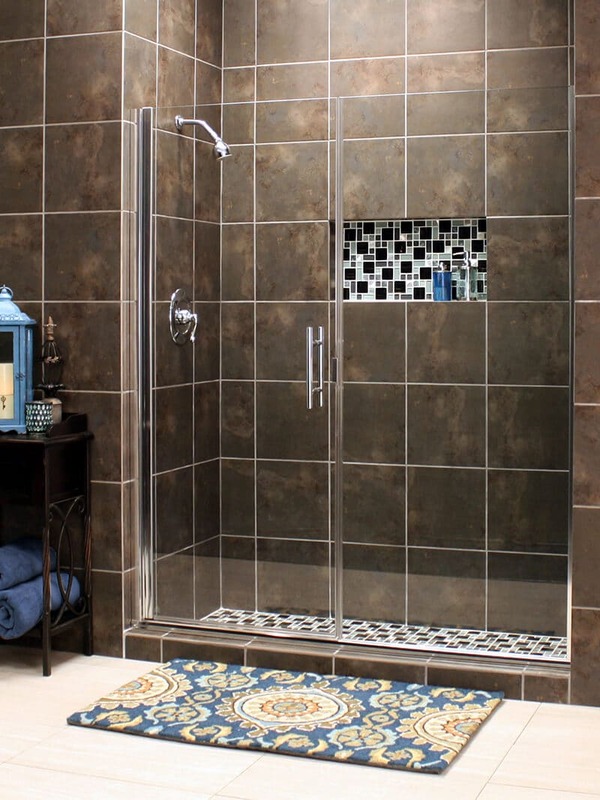 It reduces the cost of the frameless shower because the glass does not need to be drilled or notched. Typically a frameless shower enclosure is top of the line, making it more expensive than a framed shower enclosure. SEMI FRAMELESS SHOWER ENCLOSURES have metal around the frame but there is either no frame on most of the door, or the door is completely frameless. The advantage of semi-frameless shower enclosures is that using some frame helps with the support of the enclosure. This allows the thickness of the glass to be reduced, in addition to the cost when compared to frameless showers. FRAMED SHOWER ENCLOSURES have framing on the whole surround and the doors. This is usually the least expensive option and is also very sturdy. Framed shower enclosures can be very attractive, but current designer trends all point to the sleeker appearance on frameless shower enclosures. As for the glass, itself you can be sure it is safety glass as it is illegal to not to use safety glass on shower enclosures. A frameless enclosure. Notice how inconspicuous the U-channel on top of the half-wall is. This design requires support, which would typically entail a header. The customer did not like the amount of metal showing with the header and elected to have us install a support arm, which looks fantastic! A semi-frameless shower enclosure, as evidenced by Cardinal's Uptown Grand series. By adding some frame but keeping the door and header frameless, this shower is as sleek as a truly frameless enclosure. Because it has some framing, it can use thinner glass and can readily adapt to walls that are not quite "square." 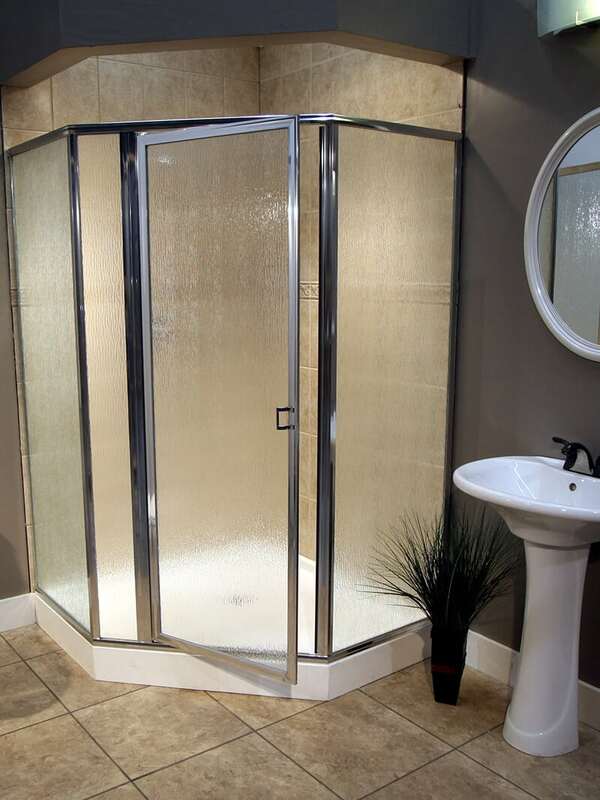 This is an example of a framed shower enclosure. This Cardinal Neo Angle framed enclosure provides maximum stability and makes the most use of the the available space in this bathroom. It makes great sense to order your shower enclosure with a surface protectant. It will not need to be cleaned as frequently, and it will be much easier when you do have to clean your enclosure. A surface protectant that repels water, oil, and is resistant to UV exposure will pay you back for the extra cost. Most surface protectants come with a ten-year warranty. These protectants are applied prior to the shower being installed. You can view manufacturer information, recommendations, and a FAQ here. 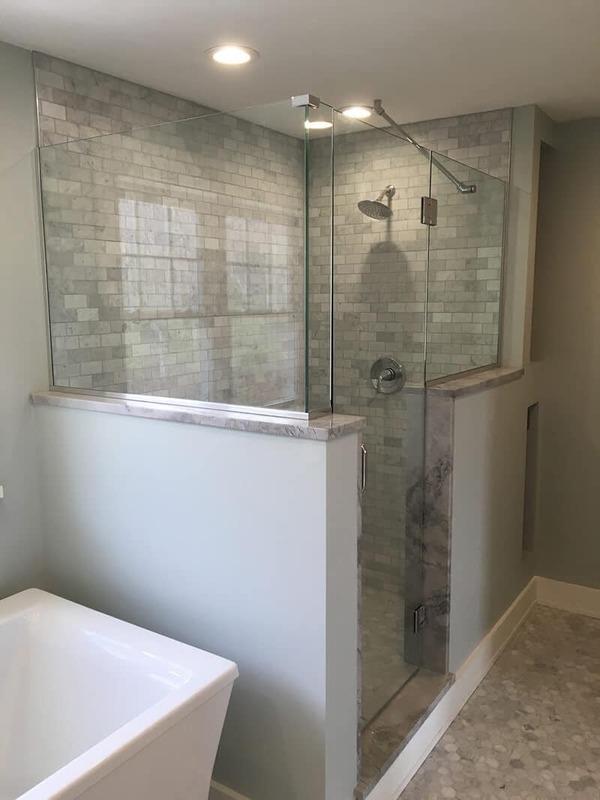 For a lifetime of gorgeous glass, you may want to consider shower glass that has been precisely manufactured with a permanent protective layer. We like to think of water as being pure and clean. That may be, but water also contains many minerals which can very slowly pit and discolor glass. If you want the most maintenance-free shower glass that will hold up for as long as you are in your home, click here to learn more about the fabulous Guardian Showerguard®. Be sure to watch the video on this page – It is very cool if you are a person that likes to know “the how and why” on interesting things. Hinge and pivot doors, in many cases, can have stops removed to swing in and out like saloon-type doors. Most customers prefer to leave the stops in and just have the doors swing out. One advantage to a double swing is that you can open the door in the inward position to drip dry. Doors that only swing inward are not allowed by national building codes. 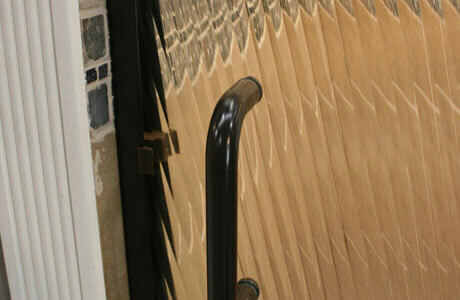 Determining which type of hinge to choose for your shower door includes various factors. Sliding doors (called bypass doors in the industry) sit on tracks and slide on the track. You can buy models which have both sides sliding on the track, or one with one side as fixed glass. Years ago, tracks had two grooves for the glass to slide in. Modern tracks have one track with drip (weep) holes to drain water and are much easier to clean. Traditional sliding doors on new shower enclosures are not very common. Sliding doors still have a major role in the bath and shower industry where they are mounted over tubs. An exception to this are trackless sliding doors. Trackless sliding doors are on the upper-end of shower doors. These doors need to be made of thicker glass and need a very strong upper track to carry all the weight of the door. Hinged doors are the most popular choice of all. You can get a traditional hinge set up on the doors very similar to the interior and exterior doors of your home. The hinges mount on the side of the door. There are also continuous hinges that run the length of the door. This hinge also affixes to the side of the door. 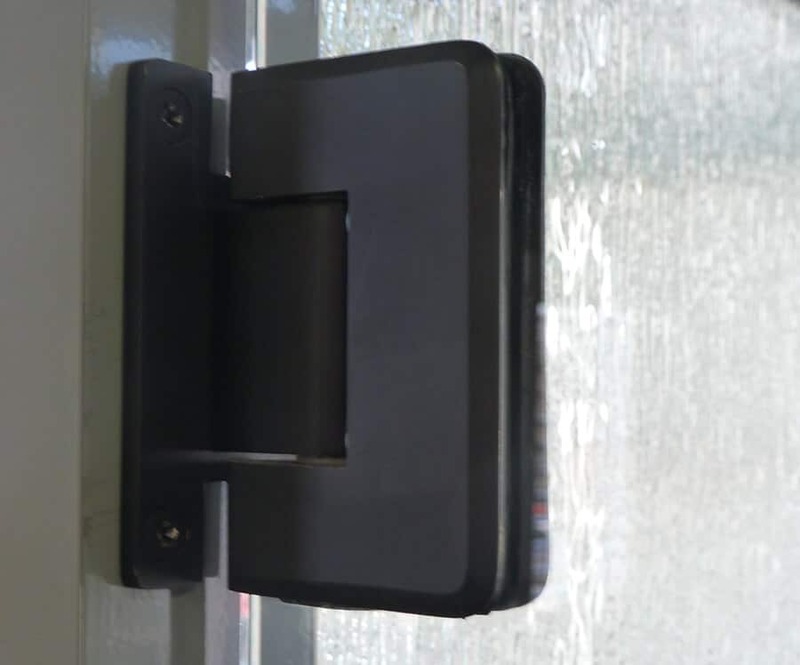 This type of hinge has a "self centering "mechanism" so that the door always returns to the closed position. There are also continuous hinges which are used when walls are "out of square." Pivot-type doors swing on the top and the bottom. This allows a very clean and sleek look to the side of the shower door due to the lack of traditional hinges. Most pivot doors require less screw holes into the tile or fiberglass. As a general rule of thumb pivot doors are easier to open and close. To best understand how a pivot door functions, walk over to your refrigerator. Look at the operation of the door. There are no hinges on the side. The door swings open on pivots at the top and bottom. Most outdoor gas grills also have doors that pivot rather than open on hinges. 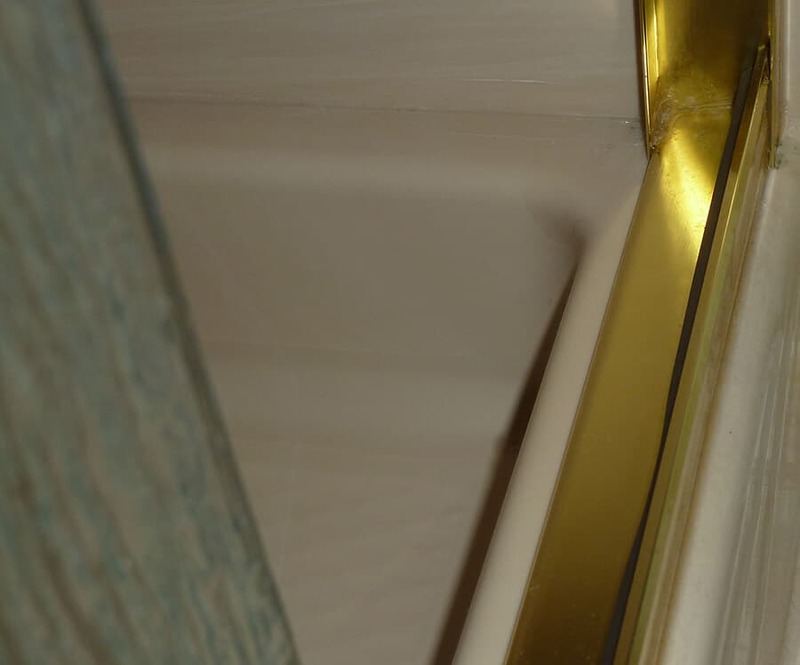 Many types of shower doors that have top and bottom pivot-type hinges also have a continuous hinge that runs in a hidden rod in the trim for extra support. 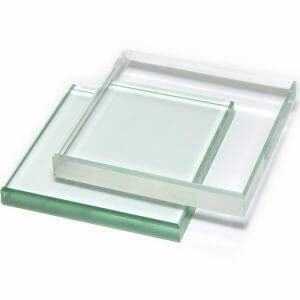 Shower glass comes in a variety of thicknesses generally ranging from 5/32” to 1/2”. The thicker the glass, the more expensive it is to fabricate and ship. As a rule of thumb, framed shower glass can be thinner due to the structural support of the metal frame. By and large, the thicker glass is considered better, but it is not so simple. 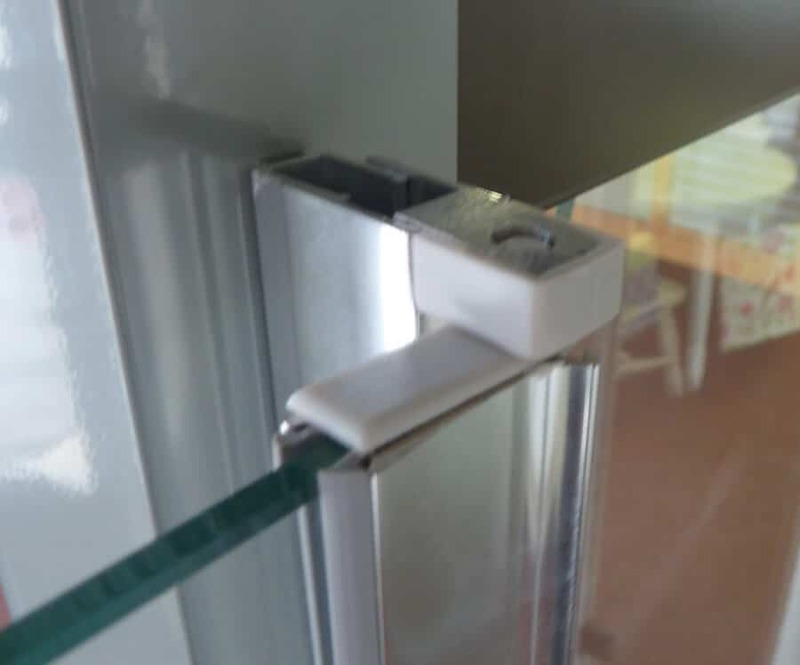 1/2” glass can be very heavy and may require extra support in the wall and hinges. The hinges may not last quite as long due to the greater stress placed on them by the weight of the glass. That being said 1/2” glass is very attractive. Our customers who prioritize high-quality framed glass tend to go with the 1/4” and for semi-framed and frameless, most times they choose the 3/8”. A comparison of low-iron (top) with clear glass (bottom). Glass that we look at every day and think of as clear is in reality slightly green. This includes window glass, cabinet glass, mirror glass, and yes, shower glass. If you order clear shower glass, you will get standard glass which has a very slight green tint due to the iron in the materials used to make the glass. If you are looking for super clarity in any glass product you can order low iron glass. This is truly clear glass. It has become much easier with the internet to determine who makes a quality product – and more importantly – if the manufacturer stands behind their product. In my prior profession in the heating and cooling industry, I was always amazed that some poorly made products with slick advertising campaigns were viewed as superior. Internet reviews (taken with a grain of salt) are a great equalizer to great marketing campaigns. Many quality manufacturers do have problems. If you can’t find any problems in the search, or if the problems are limited and the manufacturer appears to respond to the problems in a fair manner, then you have found a quality company. This basic rule of thumb should apply to any product that you are interested in buying. One of the tools I use in my searches when I am looking to buy a product is the wording "warranty problems." Rest assured that Pioneer Glass contracts with shower enclosure manufacturers that display excellent quality and strong integrity. At this point, you know pretty much what you want. Now you need to make sure you are dealing with a reputable company to buy the enclosure from and have it installed. The installation is arguably the most important component of the whole procedure. It is vitally important that you have confidence that the installer will return if there are issues. After having talked with the provider and feeling comfortable you should pretty much follow the procedure with manufacturers with one major addition. The Better Business Bureau remains one of, if not the best measure of how a company performs. You can research your company of choice by looking at the BBB's website. Pioneer Glass has an A+ rating with the BBB, and we're proud of earning that trust from homeowners. For more information on our shower doors and enclosures, please click here. This is a question that may have more than one answer. In Europe, the word screen is used differently than in the U.S. The Brits do not say "windshield" – they use the word "windscreen." Originally, a shower screen was a fixed piece of glass protecting the front half to three-quarters of the shower. The back portion or entrance was left open for access without a door. This is still very popular in Europe and in areas such as the mid-east and South America where European design is popular. As time has passed, many people have started to use the term "shower enclosure" and "shower screens" interchangeably. It’s interesting to read about the differences between trackless and track sliding doors. I’m wanting to replace my shower doors, and I think that having a sliding door could be beneficial. I’ll have to consider the thickness and whether it would be tracked or not. Thanks for the post! My aunt recently moved into an older home. She is wanting to have the bathrooms remodeled, but she’s not sure what kind of shower enclosure she wants. I didn’t realize hinge shower doors have self centering mechanisms that ensure the glass returns to its original resting place. That seems like a good option for my aunt’s home.